This was Vancouver. 1885 view of cleared forest in Granville, now Vancouver, BC. From “Wanderings with a Camera” by Erskine Beveridge. Photo: Erskine Beveridge, RCAHMS, DP050372. In the mid to late 1800s Vancouver was literally being carved out of the forest. 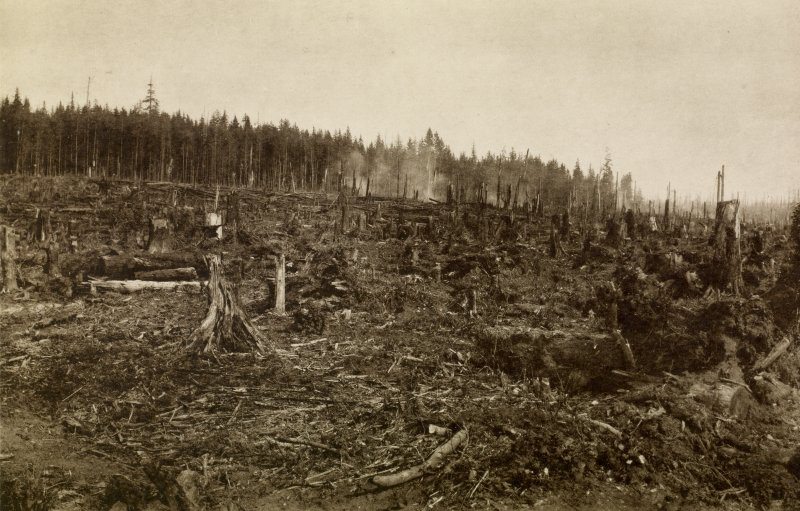 As the city grew, the forested land around the town site of Granville (later Vancouver) was being cleared resulting in great piles of slash – branches and other residue left on a forest floor after the cutting of timber. This waste material was mainly disposed of by being burned in controlled fires (one of which, infamously got out of control in June 1886 and resulted in the Great Fire) but, not all of it. Where most saw waste, a few saw opportunity. Along with the (sometimes giant) tree stumps left in the ground, this slash gave some creative/resourceful early Vancouverites lots of raw material to work with. 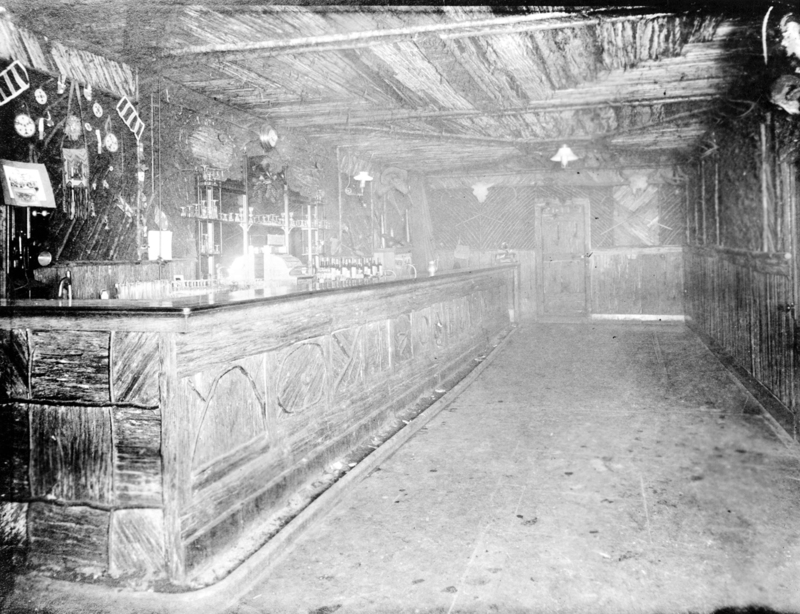 The bar at the Poodle Dog Hotel. Bar at the Poodle Dog Hotel, ca. 1898. Photo: CoV Archives – Hot P5. Though the image above is a little primitive (early artificial light photography), you can still see the amount of intricate work that Cary did. It sort of has the feeling of an old west tiki bar. The Poodle Dog Hotel first appears in the 1896 city directory at 318 Cordova with C.S. McKinnell listed as the proprietor. Two years later, in the 1898 directory (same date as the photo), the proprietor of the Poodle Dog Hotel is now listed as a H.F. [Bert?] Burton. This must be the Burton that Matthews’ notes refer to and who had George Cary build him the unique and rustic bar. According to Matthews’ notes, Cary even spelt out the owner’s name in big letters made of maple twigs along the front. 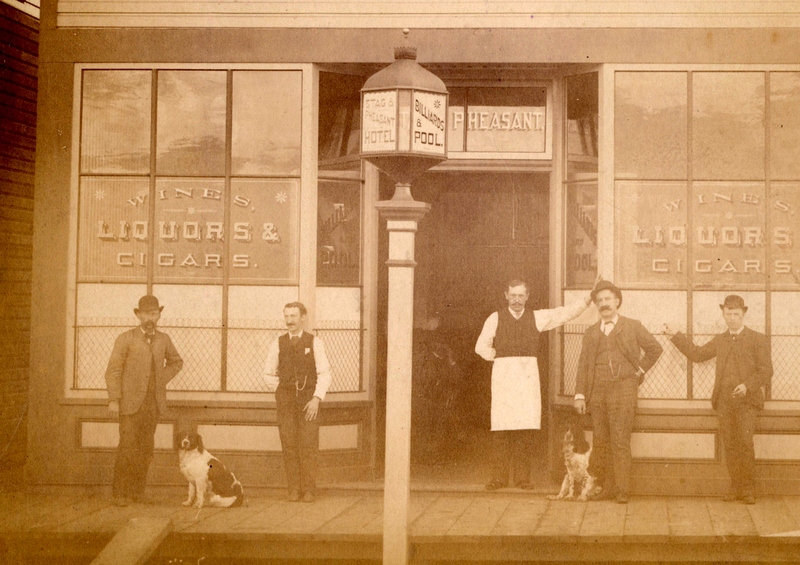 “The Poodle Dog” was on Cordova Street between Cambie and Homer Street. The stump for this stump house (or rather shack) was likely left over from when Mount Pleasant was cleared of its trees to make way for the ever growing need for land and of course, timber. These two side-by-each stumps were converted into a shack by Swedish immigrant Gustav Burkman, a carpenter/builder who lived at 4230 Prince Edward St. (formerly Seacombe Rd.). The stump house was located on the east side of Seacombe Road, now Prince Edward street, between E. 26th and E. 27th Ave. It was reached by a short trail from Horne Road (now E. 28th Ave). According to the notes made by Major J.S. Matthews, this photo was taken by photographer W.J. Moore, who lived nearby, and who also provided some of the particulars. The narrative for this stump house was cobbled together by Major Matthews from the information he gleaned from Moore (the photographer) and a conversation he had with the Burkman’s foster daughter, Mrs. Robert Williams, in 1963. Apparently the Burkman’s (Gustav and Hannah) came to Vancouver via Seattle during Vancouver’s Real Estate boom (ca. 1905-1912). The large hollow stump near their property, was converted into a shack, or tool house, and was about half a block from the Burkman’s house in Mount Pleasant. One has to remember that at that time city blocks didn’t look the same as they do today, and often houses were few and far between. Mrs. Williams recalls that an old gentleman (then in his 70s), Mr. Cunningham, lived inside the stump. The Lower stump was the kitchen, and the lower part of the higher stump on the left was the living room. The sleeping area was in the top of the higher stump (a loft?) and was reached via a ladder. 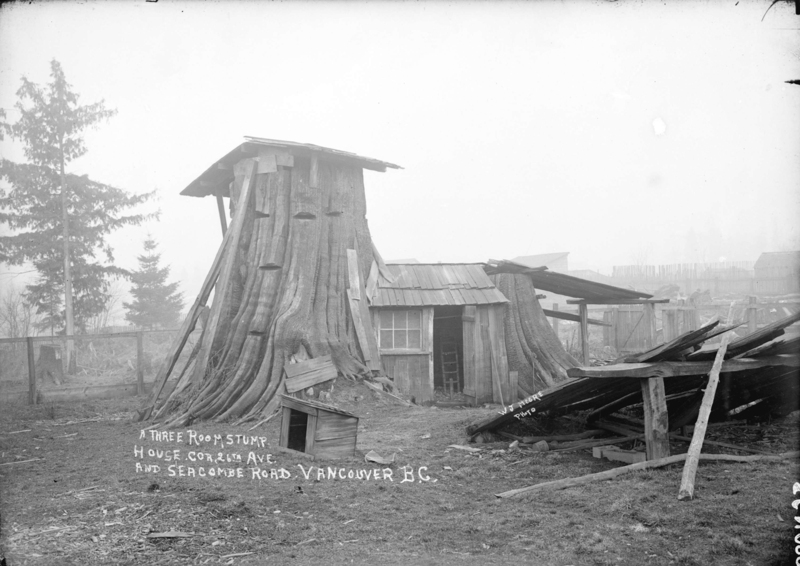 The date of the photograph of the stump house is most likely around 1912. This would coincide with the time period that Moore and Burkman were in the Mount Pleasant area. They both first appear in the Vancouver city directory that same year. J. W. Horne real estate office in big tree. Real estate office in big tree [Georgia Street, near Granville], May 1886. Photo: CoV Archives – LGN 453. Though this is a promotional stunt, it still shows excellent use of land-clearing forestry detritus. 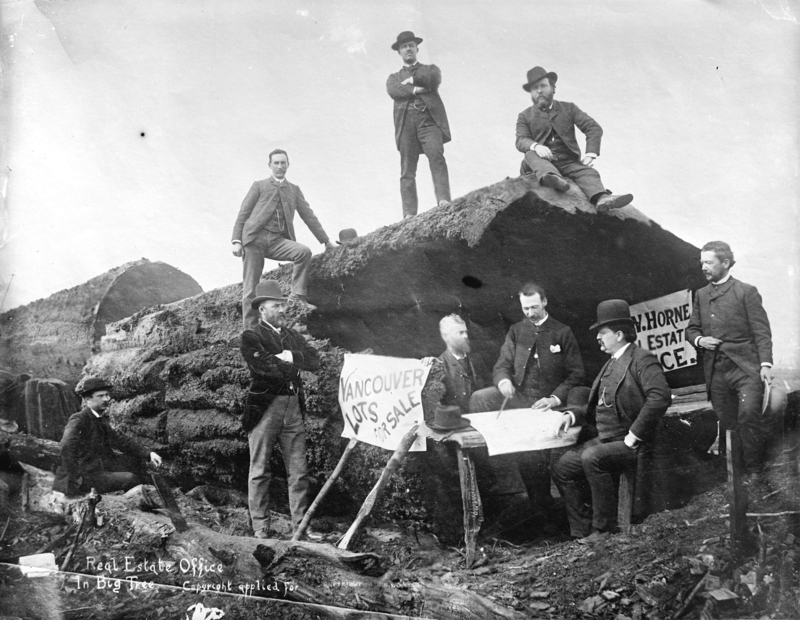 The photograph shows a group of men posing on and around large tree stump used as the staged office for real estate capitalist, James Welton (J.W.) Horne. He used the photo to promote the sale of lots in the new city of Vancouver. The men in the photograph on the ground are (L-R): Mr. Stiles, A.W. Ross, Dr. Luke Port, J.W. Horne, Mr. Hendrickson, and U.S. Consul Mr. Hemming. The men on the log are (L-R): H.A. Jones, Mr. Perry, and an unidentified man thought to be Mr. Perry’s partner. This identification is based on Major J.S. Matthews’ notes with the print indicating identification provided by the photographer H.T. Devine who took the photo in May 1886. Considering that the large area we call Vancouver today, was clear-cut of its old-growth forests in the second half of the 1800’s it is not surprising then that some inventive citizens would take advantage of all that debris and get creative. Fun Fact: Tree stump houses were actually quite common in the Pacific Northwest. They were the only thing that remained of a logging industry once enriched by the giant trees of the old-growth forests.